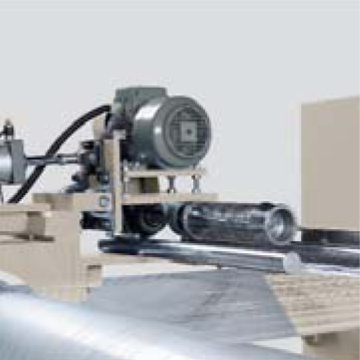 The extrusion line has maximum PP melting output. Capacity is 160 ~ 520 kg/h and the unit is equipped with a screen filter changer and rotary blade slitting system. 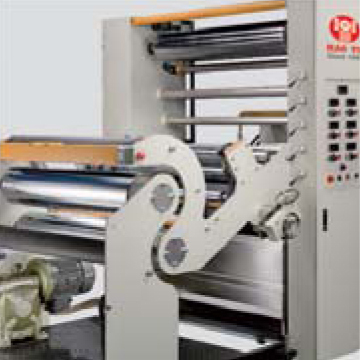 The machine has less down time and prevents production loss. 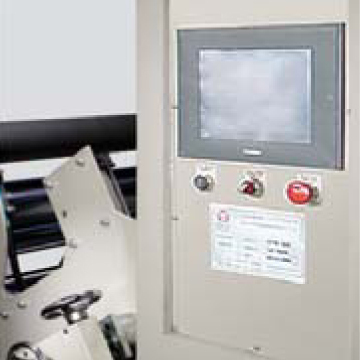 The pressure rollers of the take-off unit are pneumatically controlled, and have synchronized control electronic system. European gearbox, static mixer, screen filter changer, inverter, electrical part, etc... and human machinery interface & tape fibrillator device are available to meet special requirements. 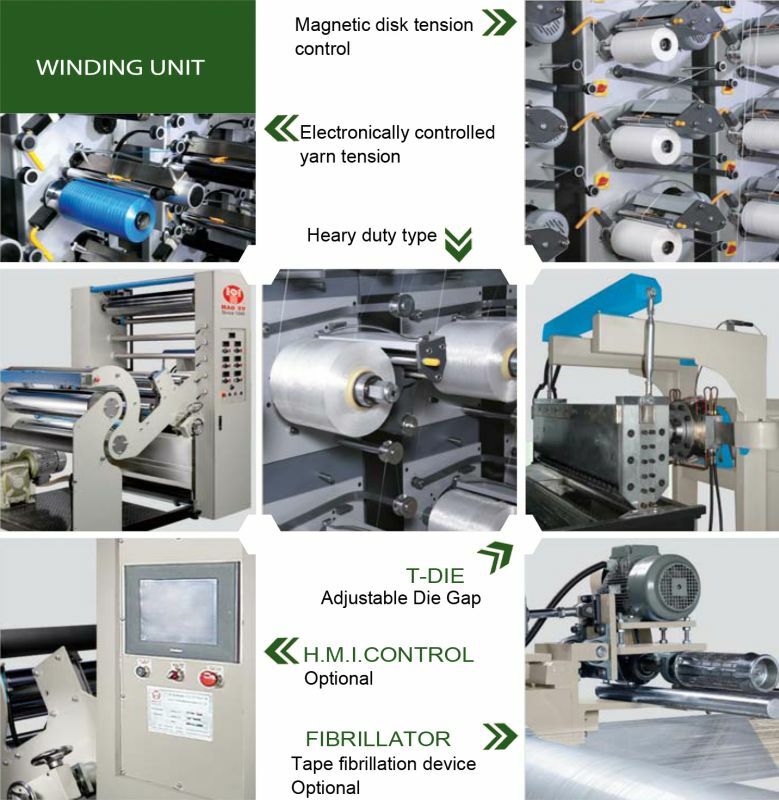 Raffia tape stretching line is designed for producing PP/HDPE raffia tape and flat yarn which used for woven bag, geotextile, artificial grass, carpet backing production, and more. Capacity is 160-520 kg/hr,and the unit is equipped with a belt type screen filter changer and rotary type slitting unit for none stop operation. 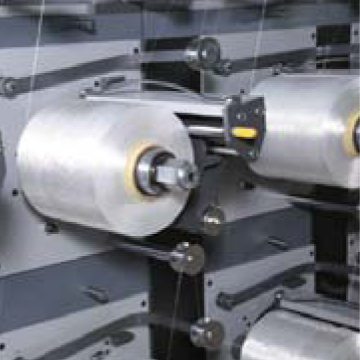 The tape plant has low energy consumption, less down time and reduces production loss. The pressure roller of the equipment are pneumatic controlled, and have one-step synchronize control electronic system. The machine can incorporate with European-made gearbox, T-die, melt pump, tape winder upon customer's special requirement. Designed for making 500-1500 denier (2000-6000 denier upon special request).Working speed from 100-270 meter/minute. Air Conditioning unit for electrical cabinet. The T-Die gap is adjustable. 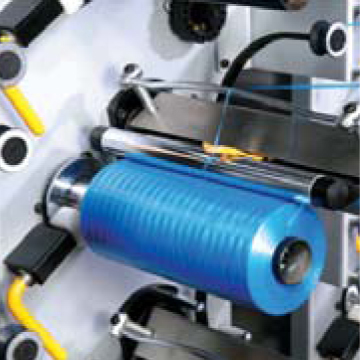 Suitable for extruding PP and HDPE. The screw and barrel are manufactured from SCM-1 alloy steel, nitrogen treated and precision ground. Gears inside the gearbox are precision ground for noise-free cooling the oil of the gearbox. 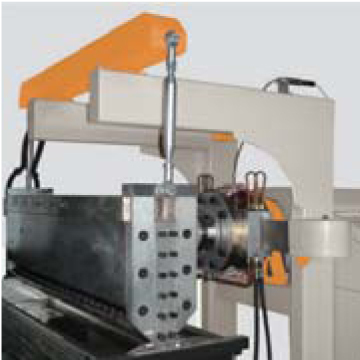 Built with auto loader and patent design material force feeding unit. Choice of AC or DC motor drive. Constructed with 1~6 rows of slitting blades. The slitting width is adjustable. Full pneumatic operation for convenience. Fitted with edge trim auto - recycle unit. Two stages hot air circulation system ensures raffia tape proper stretched. Air flow volume is adjustable. 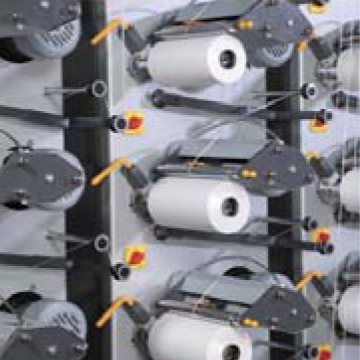 Exclusive 2 independent driving motors provides raffia tape with superior quality. Waste yarn collection box for reclaiming is provided. Magnetic disk tension control available.